The EU's newest member state is starting for a new objective - membership, first in Schengen, and then in the euro area. The Croatian government expects preparations for Schengen to be completed in 2019 and for the euro area it will take more time. To Prime Minister Andrej Plenkovic this is an expression of pro-Europeanism, thus, he says, euro area membership is pro-Croatian. 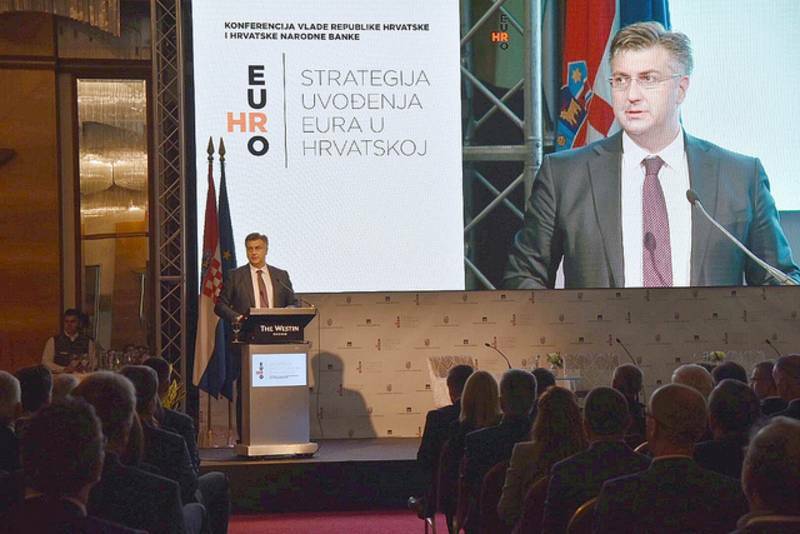 Joining the cores of European integration has been a major priority for Mr Plenkovic's government ever since his party, Croatian Democratic Union (HDZ), won the elections last year on a pro-European programme. Despite the political jolts and change of the coalition partner in motion, the first step in the preparation to introduce the euro has been made last week when a strategy for euro area accession was presented. Judging by the overall organisation, it was evident that a lot of work was invested in the event. The strategy was presented in both Croatian and English language, several informative animation video clips have been presented explaining the pros of the single currency, a special webpage [in Croatian] has been created on the Croatian National Bank's website (HNB), dedicated on the common currency. The presentation of the strategy, during a several-hour long conference, marked the launch of a public debate of the pros and cons of introducing the euro. For now, leaders are refraining from committing to a specific accession date, but in Prime Minster Plenkovic's and central bank President Boris Vujcic's words, it is realistic to expect that Croatia can join the exchange-rate mechanism (ERMII) by the time of Croatia's EU Council Presidency (2020). This suggests that it is possible Croatia to become part of the currency club in 2022 or 2023. Since its EU accession on 1 July 2013, Croatia has been in a condition of post-accession stress - without clear horizon and entirely consumed by domestic political issues. According to local analysts and politicians, the introduction of the common European currency is that so necessary third national target (after independence and EU and NATO accession) which can unite society in making the next step of its transformation. PM Andrej Plenkovic believes that the most important benefit from introducing the euro is that it will bring global political and economic credibility. "The common European currency is a key element of the project for European integration, especially when it comes to strengthening the single market, most of all because of the easier economic exchange with 19 member states and 340 million Europeans who use the euro", he said. Beyond the very geopolitical statement, which undoubtedly is very important both for the EU and Croatia, the country has very objective reasons to want to join the euro as soon as possible. 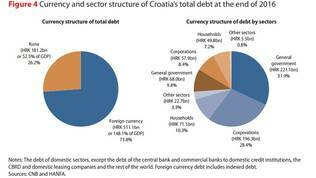 Croatia is currently the only one of the smallest and open economies of the EU which has not yet introduced the euro. Moreover, the country is very highly integrated in the European economy - 60% of Croatia's trade is with the euro area countries and 70% of the revenues from tourism come from the eurozone. A large part of the banking system is owned by banks in the euro area. 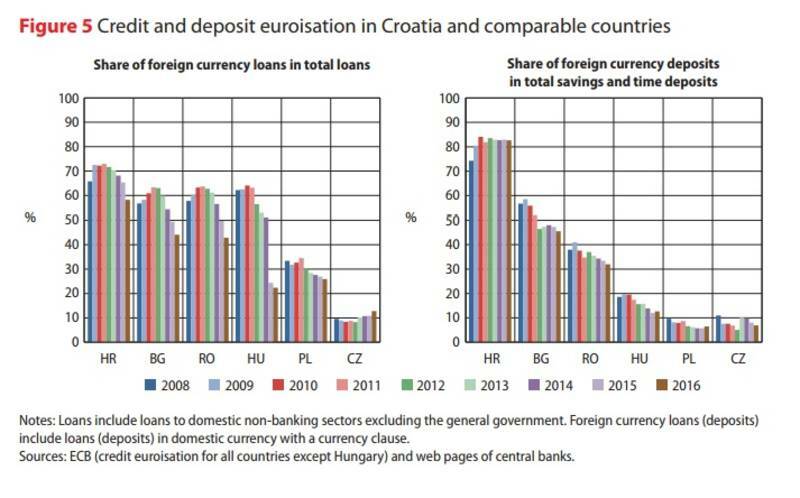 Croatia is also the most euroised economy of all non-euro area members - more than 90% of foreign currency debt is in euro. 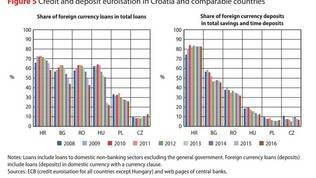 The share of deposits in foreign currency is 83%. This is the reason why HNB's manoeuvre space is very small, governor Boris Vujcic explained. For the past years, the bank's main task has been to maintain the kuna's exchange rate stable in order to keep indebtedness under control and to not harm exports. Joining the euro area will completely eliminate the currency risk, said Mr Vujcic. He also gave the following example in support of his arguments. If an investor wants to invest 100 million euro in Croatia and the kuna exchange rate lost 10% to the euro he will lose 10% or 10 million euros. When this risk disappears investments will increase, as they have not yet reached their pre-recession levels. Boris Vujcic said Croatia has nothing t o lose by transferring its monetary sovereignty over to the ECB because even now its monetary policy is significantly constrained. 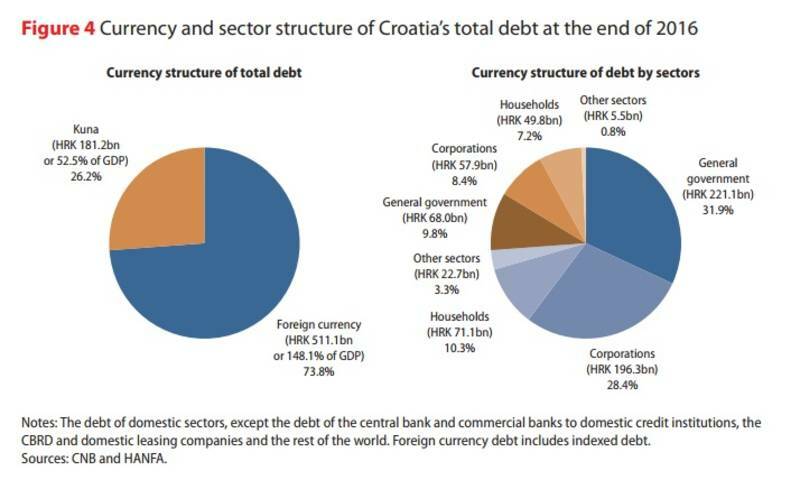 At the moment, Croatia fulfils almost all accession criteria, except the one that covers the level of public debt - it should not exceed 60% of GDP. In the second quarter of this year, the debt-to-GDP-ratio was 81.9%, according to the latest Eurostat data. The ambition of the government is to reduce it to 72% of GDP by 2020. In the national reforms programme is set the target of 65% of GDP by 2022. Finance Minister Zdravko Maric is not worried about this because, he said, what is important is the trend. "Most countries in the EU and the euro area have debt levels over 60%", he said and recalled that there is another rule which states that a clear trend for debt reduction is sufficient. This means that Croatia has to reduce its public debt by 1.3 percentage points annually, which is plausible because last year it made a two times faster reduction, the finance minister said. Favourable economic conditions create a very good environment for debt reduction. The country exited last year a very painful recession which lasted more than 6 years, and this year it exited the excessive budget deficit procedure. Economic growth is expected to be 3.1% this year and 2.8% next year, according to the International Monetary Fund's projections. 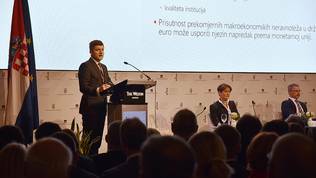 Minister Maric acknowledged that, at the moment, the moods in the eurozone are for deepening of integration rather than enlargement. IMF welcomed Croatia's plan to introduce the euro but warned that, in order to achieve maximum success, it needs to accelerate implementation of structural reforms - something which has proved to be a mission impossible for years. IMF also recommends quick reduction of public debt in order to create fiscal space in support of growth in case of a new downturn. Among the recommended reforms is to improve competitiveness, reduce administrative burden for businesses, increase flexibility of the labour market, improve efficiency of the public sector, enhance property rights and judicial procedures. HNB and the government agree that benefits from joining the eurozone significantly outwiegh costs. To change banknotes and coins Croatia is expected to spend 0.5% of its gross domestic product, which the minister of finance admitted is a lot but said this is a one-off. Apart from that, Croatia has to pay the remainder of its capital in the ECB - 62.8 million euros, a contribution to the ECB protection layers - around 300 million, transfer part of its reserves - cca 350 million euro. Croatia will also participate in the capital of the permanent rescue fund (ESM) - 425 million in the first 5 years or 85 million annually. 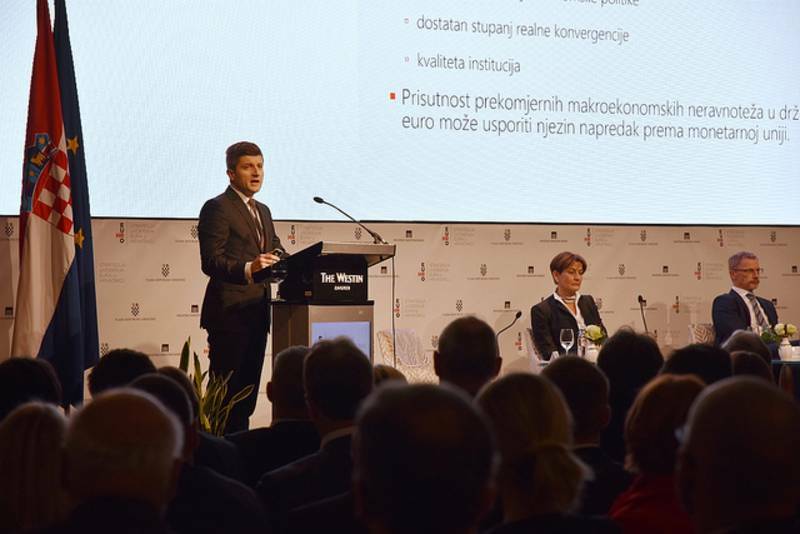 At the same time, Croatia will have full access to the financial instruments of the euro area should it be in need. 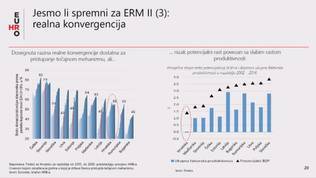 When there is no such need, the benefits are much lower costs of banks to access financial resources, reduction of interest rates to levels close to euro area core which will increase the competitiveness of the Croatian economy. It is also expected the costs for interbanking transfers to be significantly reduced. Prime Minister Andrej Plenkovic pointed to another big pro from introducing the euro - wage increase. In the past 12 years, the average gross wages in the Central European countries which introduced the euro increased much faster than in Croatia - by 37% in Slovenia, 60% in Slovakia, 88% in Lithuania and Estonia, 136% in Latvia and in Croatia wage growth was just 29%. Citizens' biggest concern from introducing the euro is price growth. According to analyses, even now can be observed the phenomenon of European prices but Croatian wages. Boris Vujcic quoted statistical data from previous euro area enlargements, which say that inflation rose between 0.2% and 0.3% as a result of euro introduction. Economic analysts warned, however, that such data should be approached with care because in past cases inflation was due to other factors, such as oil prices and not to euro introduction. The government and HNB will launch a massive information campaign in the coming weeks. The premier rejected the possibility of a referendum on euro area accession. In his introductory statement at the beginning of the conference last week, he said that Croatia had already said "yes" to euro area accession by signing its EU membership treaty, validated at a referendum. Asked specifically by euinside, he said there was no need of a separate referendum. Plenkovic, however, refused to speculate on the possibilities a certain group to decide collecting signatures for a referendum, which has become a practise in recent years in Croatia when it comes to sensitive issues. 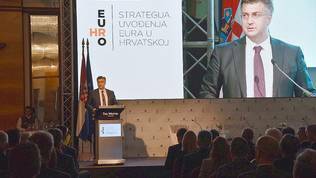 "I think the euro is an opportunity which Croatia has to grasp and which we have to prepare well for, and which is to confirm the responsible economic policy of the government and to give Croatia a chance for further development and stability of the economy", Mr Plenkovic added. The reactions that ensued after the presentation of the strategy were weak. The prevailing comments are that the government is trying with this strategy to create smoke and mirrors to distract public attention from the biggest scandal in the country at the moment - the crisis in the Agrokor concern. It is a fact, however, that Croatia's euro area accession was a major priority of the government long before it emerged that Agrokor is in trouble. The prime minster mentioned the concern in the context of the decision to start eurozone preparations by saying that the situation is under control and will not have an impact on the country's economic perspectives. IMF shares that opinion, saying that the adopted law on systemically important companies was a good solution of the Agrokor crisis but recommended the government to identify and resolve the rest of the problems which could impact corporate governance, like accounting and auditing standards, insolvency resolution and lenders' rights. The Fund also calls for progress in resolving the Agrokor crisis in a transparent way. As if to prove its determination to introduce the euro, Croatia will join the fiscal compact too - an intergovernment agreement which imposes stricter fiscal discipline on the member states. Boris Vujcic explained that it was decided Croatia not to join the banking union before introducing the euro because this would cost more than the benefits. In the coming weeks, HNB will organise a series of round tables inviting experts from the new euro area members in order to learn from their experience.